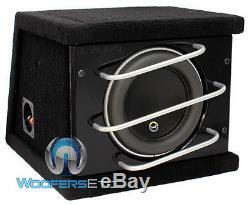 CLS112RG-W7AE - JL Audio 12 Single 12W7AE Loaded Subwoofer Enclosure. 12 Single 3 Ohm W7 Series Subwoofer. Massive forced-air-cooled aluminum alloy frame. Highly linear, DMA-Optimized motor system. Huge diameter, progressive roll spider. Bright nickel finish clamp ring. Unique Anniversary Edition badging and labeling. PowerWedge W7AE Sealed Compact Enclosure. High quality V-groove MDF construction. Provides a detailed and smooth response. High grade black carpet finish. Gloss black laminate front baffle trim. Engraved JL Audio and W7 logos. 3 solid brushed aluminum rods act as a grille and provide excellent woofer protection. Dimensions: 11-1/4" TD x 17" BD x 21-1/4" W x 16-1/2" H. You will be issued a Return Authorization Number. In order to maintain an inventory of 100%, Brand New, A-Stock, untouched products, all sales are final. We ask that you please be sure you are ordering the correct product. The item "CLS112RG-W7AE JL AUDIO 12 SINGLE 12W7AE LOADED SUBWOOFER ENCLOSURE BASS BOX NEW" is in sale since Wednesday, September 5, 2012.